Dougie P is gonna let Wentz sling it. When the Eagles traded Sam Bradford to the Minnesota Vikings and named Carson Wentz the starter, they went from a conservative pocket passer to more of a gunslinger with running ability. In terms of constructing a game plan, what makes sense for one quarterback probably doesn't make sense for another. On Wednesday, Doug Pederson hinted at some of the ways Wentz might be used. After the Eagles drafted Wentz, Pederson said that he liked Wentz's aggressiveness, and even pointed to Brett Favre as an NFL comparison. "A little bit of Brett Favre, honestly," Pederson said back on draft night. "He's got that mentality. He's got that aggressiveness that Brett had. Those are some of the skill sets that I see in Carson – that aggression, that ability to throw the ball down the field. I love quarterbacks that are willing to take a chance, take a calculated risk down the field. Favre was that way. I see a lot of the same characteristics in Carson." Pederson said Wednesday that he does not want hold Wentz back. "I don't want to harness that aggression," said Pederson. "I don't want to harness that ability to throw the ball down the field. I think we're capable of doing that. I think he's good at doing that. You obviously want to get into the flow of the game and see defensive they're going to scheme him and scheme us, and then you let your game plan sort of unfold from there." In other words, don't expect Checkdown City, USA. "Utilizing Carson's strengths, obviously his ability to run, obviously him over Sam, there's the ability to run, and it may open up a run or two there that we can utilize, and again we have to be smart with that," said Pederson. At the same time, Pederson doesn't want Wentz trying to put his head down and run defenders over like he often did at North Dakota State. "He understands that in this day in age the football game, and especially with the run-pass options that teams are doing, that defenses are attacking quarterbacks in that manner, and that's just the style that you're seeing. So we've communicated that to him – myself, John (DeFilippo), Frank (Reich) – that you have to protect yourself at all costs, whether it's a run or a pass. "And whether you're outside the pocket or not, sometimes it's out of your control. At the same time, knowing where you are on the field, I don't need that extra yard. We're not playing for the NFC Championship Game this Sunday. It's Game 1. I don't need necessarily need the extra yard. Somewhere in the season will I need the yard? Yeah, I'll need the yard, but protect yourself. Slide, get out of bounds, get down, and he's very aware of that." "I just know playing the position when quarterbacks get hit early, it affects you the rest of the game, so protecting him early, keeping him upright is the key not only to his success and longevity but our success as a team," said Pederson. Obviously, protecting the quarterback is something every football team strives to do. However, Pederson specifically noted that he wanted to protect Wentz early in the game, which is probably a smart approach. 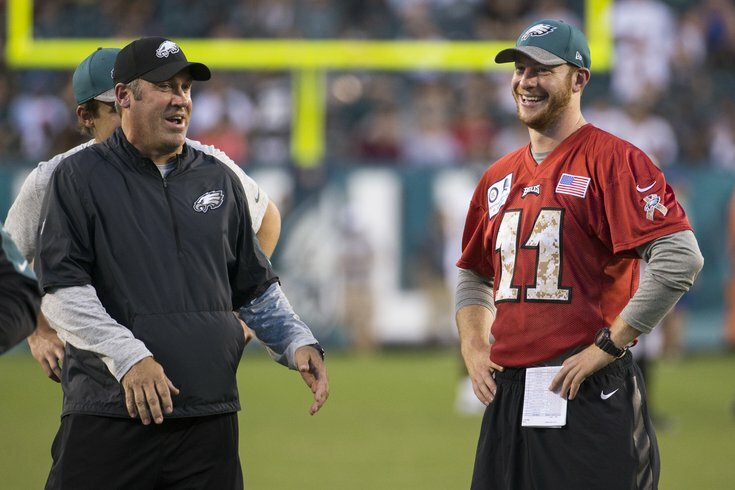 While Pederson said that he's going to allow Wentz to let it rip, you may not see that on the opening drive, like Andy Reid loved to do with his quarterbacks.